Authors: Abdalla, A. S., Elfadil, A. D. and Mohamed, M. R.
Authors: Ferdous, J., Chul-Hyun A., Rahman, M. S., Hossain, F. M. M. and Hasan, A. K.
Ferdous, J., Chul-Hyun A., Rahman, M. S., Hossain, F. M. M. and Hasan, A. K. “Effect of plant density and fertilizer rate on the performance of short duration mustard cv. BARI Sarisha-14”. Journal of Bioscience and Agriculture Research, 16.01(2017), 1309-1313. Authors: Miah, K., Hossen, B., Haque, M. S., Tareq, M. Z. and Begum, S. N.
​Authors: Naz, S., Rehman, A., Ahmed, M. Z., Amrao, L. and Ghuffar, S.
Abstract: Mango (Mangifera indica L.) is an important fruit of Pakistan which is widely cultivated throughout the world. Fungal diseases of mango are the most important biological constraint to productivity. Out of which sudden death disease causes significant losses. The present investigation is carried out to characterize Ceratocystis fambriata causing mango sudden death disease and its management by application of different fungicides. During the survey 14 isolates of Ceratocystis fambriata causing sudden death disease was collected from Muzaffargarh district. The isolates were identified on the basis of cultural and microscopic features. After 6 days during cultural studies maximum growth was observed on Czepk and Malt extract medium (85 mm) and minimum growth was on PDA (74.1 mm). The colonies colors range from grayish, slightly white to light brown having smooth, circular and regular or irregular margins on the surface. Perithecia was black to brown, smooth, circular and regular or irregular, Aascospore was hat shaped ranging 4.18- 6.34 μmx 3.15 - 4.88 μm, Aleurioconidia ranging 17.1- 18.5 μmx 9.04-10.09 μm, Endoconidia ranging 22.5-24.2 μmx 3.90-5.30 μm. During pathogenicity test, result showed that infection started after fifteen days of inoculation. The pathogen covered 1.3 cm after fifteen days. Final reading was taken on the forty five day, when the pathogen colonized up to 3.25 cm. Among different fungicides the results after 2, 4 and 6 days revealed that Topsin- M was found most effective for controlling the growth of Pathogen that showed colony diameter 0.20, 0.50 and 1.3 cm at 200 ppm followed by Score, Nativo, Cabriotop and Copper oxychloride respectively. Naz, S., Rehman, A., Ahmed, M. Z., Amrao, L. and Ghuffar, S. (2018). Cultural and morphological characterization of Ceratocystis fambriata causing mango sudden death disease in district Muzaffargarh, Punjab, Pakistan and its chemical control. Journal of Bioscience and Agriculture Research,16(01), 1330-1336. Naz, S., Rehman, A., Ahmed, M. Z., Amrao, L. and Ghuffar, S. “Cultural and morphological characterization of Ceratocystis fambriata causing mango sudden death disease in district Muzaffargarh, Punjab, Pakistan and its chemical control”. Journal of Bioscience and Agriculture Research, 16.01(2018), 1330-1336. Naz, S., Rehman, A., Ahmed, M. Z., Amrao, L. and Ghuffar, S. “Effect of seed priming on growth and physiological traits of five Jordanian wheat (Triticum aestivum L.) landraces under salt stress”. Journal of Bioscience and Agriculture Research, 16. no. 01(2018), 1330-1336. ​Authors: Alam, M. S., Segovia, P. A., Islam, T. and Saha, K. K.
Abstract: The beef cattle production system is a complex system as it includes biological, economic and social factors which are also individually intricate in nature. In this approach a simplified relationship and interactions between various factors that control the system have been presumed to develop the integrated model of meat production, use and storage of forage, manure excretion and emission. Three major subsystems namely meat production, forage management and emissions were described separately and finally combined into a single system to simulate the system output. A dynamic Monte Carlo simulation software (GoldSim) has been used to simulate the system. Various management scenarios are considered to see the model performance and uncertainty. Alam, M. S., Segovia, P. A., Islam, T. and Saha, K. K. (2018). An integrated model of forage, meat and emission in a beef cattle production system. Journal of Bioscience and Agriculture Research,16(02), 1337-1347. Alam, M. S., Segovia, P. A., Islam, T. and Saha, K. K. “An integrated model of forage, meat and emission in a beef cattle production system”. Journal of Bioscience and Agriculture Research, 16.02(2018): 1337-1347. Alam, M. S., Segovia, P. A., Islam, T. and Saha, K. K. “An integrated model of forage, meat and emission in a beef cattle production system”. Journal of Bioscience and Agriculture Research,16 no.01(2018):1337-1347. Abstract:​ A field experiment was performed during winter season from December 2015 to March 2016 at the Horticulture farm, Department of Horticulture of Sher-e-Bangla Agricultural University, Dhaka to investigate the influence of different supplemental LED spectrum on growth and yield of Strawberry. Five treatments viz. Control (L0), White LED light (LW), Blue LED Light (LB), Red LED Light (LR) and Combined Red and Blue LED light (LR+B); were used in this experiment arranged in randomized complete block design (RCBD) with. LB treatment showed best performance regarding vegetative growth (plant height 33.7 cm, leaf area 88.8 cm2, No. of leaf/plant 25.3, No. runner/plant 6.0 and No. of stolon/plant 5.0) whereas LR showed best in reproductive growth (Days to first flower bud, flowering, fruit setting and harvesting 52.0, 54.0, 67.3 and 101.3 days respectively). LR+B treatment showed statistical similarity to the best in all the parameters and gave the highest yield (yield/plant and yield/ha 475.3 g and 16.6 ton respectively). So, a combined supplementation of red and blue LED light can be recommended to boost the quality and production of strawberry. Jamal Uddin, A. F. M., Hoq, M. Y., Rini S. N., Urme, F. B. R. and Ahmad, H. (2018). Influence of supplement LED spectrum on growth and yield of Strawberry. Journal of Bioscience and Agriculture Research,16(02), 1348-1355. Jamal Uddin, A. F. M., Hoq, M. Y., Rini S. N., Urme, F. B. R. and Ahmad, H. “Influence of supplement LED spectrum on growth and yield of Strawberry”. Journal of Bioscience and Agriculture Research, 16.02(2018): 1348-1355. ​Authors: Abubakar, Z. A. and Ali, A. D.
Abstract:​ The study which aimed at evaluating the effect of different organic manure on the growth of maize was conducted at the Allies Gardens and Landscaping, Gombe State, Nigeria. The study was conducted from March 2017 to May ending 2017, experimental period was 12 weeks. Treatments were the three sources of nutrients and control; poultry manure (PM), cattle dung (CD), inorganic fertilizer NPK. Different treatment rates of PM, CD and NPK were replicated 4 times, a total of 48 experimental poly pots were used in the research. The parameters measured were number of leaves, plant height, leaves area root shoot and plant biomass. The study revealed the effect of applied organic manures (PM and CD) on the vegetative growth of the maize crop which suggests an improvement in growth and future yield of the maize plant. This is anticipated to replace the use of NPK. Abubakar, Z. A. and Ali, A. D. (2018). Screening effect of organic manure on the vegetative growth of maize (Zea mays L). Journal of Bioscience and Agriculture Research,16(02), 1356-1364. Abubakar, Z. A. and Ali, A. D. “Screening effect of organic manure on the vegetative growth of maize (Zea mays L)”. Journal of Bioscience and Agriculture Research, 16.02(2018), 1356-1364. Abubakar, Z. A. and Ali, A. D. “Screening effect of organic manure on the vegetative growth of maize (Zea mays L)”. Journal of Bioscience and Agriculture Research, 16. no. 02(2018), 1356-1364. ​Authors: Yila, K. M., Momoh, E. J. J., Ndoko, E. J., Mansaray, A. and Conteh, A. R.
Abstract:​ Field experiments were conducted at SLARI’s on-station sites located at Rogbasha, Sumbuya and Serabu during the year 2013 cropping season to evaluate the influence of planting date on the phenology and yield of soybean genotypes in Sierra Leone. The experiment was arranged in a split plot design with 3 replications in each location. Five planting dates (June 7, June 28, July 14, August 15 and September 5) were assigned to the main plots and five soybean genotypes (TGx 1448-2E, TGx 1904-6F, TGx 1951-3F, TGx 1951-4F and TGx 1955-4F) to the subplots using a randomized complete block design. Planting date had a significant influence on the phenology and yield of the soybean genotypes evaluated. The number of days from emergence (VE) to full flower (R2), full pod (R4) and physiological maturity (R7), thenumber of pods plant-1, 100-seed mass and grain yield for each soybean genotype decreased significantly in each location when planted late i.e. August 15 and beyond.The grain yield, number of pods plant-1 and 100-seed mass of soybean depend directly on the influence of the days to full fower, full pod and physiological maturity. The significant decrease in the days to full fower, full pod and physiological maturity in soybean when planted after July 14 altered the optimum yield potential in the soybean genotypes. For optimum grain yields, farmers in Sierra Leone should plant TGx 1448-2E, TGx 1904-6F, TGx 1951-3F, TGx 1951-4F and TGx 1955-4F not later than mid-July under rain-fed conditions. ​Authors: Ahmed, M., Ferdous, Z., Paul, M., Rashid, M. H. & Hossain, M. S.
Abstract:​ The experiment was carried out to evaluate the effect of dietary vitamin C on the growth and survival rate of rohu (Labeo rohita) for a period of 49 days from 5th April to 24th May, 2016 in 12 experimental aquaria in Wet Laboratory of the Department of Aquaculture, Bangladesh Agricultural University, Mymensingh. Fingerlings of initial weight of 6.02±0.00 g was released at the same stocking density (12 fingerlings per aquaria). Four different treatments (T1, T2, T3 and T4) each with three replications were used having different amount of vitamin C, T1 (0 mg vitamin C/kg feed), T2 (200 mg vitamin C/kg feed), T3 (400 mg vitamin C/kg feed) and T4 (600 mg vitamin C/kg feed). All four diets having a constant inclusion level of the following ingredients: fish meal 40%, rice bran 25%, wheat bran 25%, molasses 5%, soybean oil 4% and vitamin and mineral premix 1%. Final weight (g), weight gain (g), percent weight gain (%), specific growth rate (%/day), and protein efficiency ratio, varied from 7.31±0.14 to 7.83±0.15, 1.29±0.14 to 1.8±0.15, 21.48±2.37 to 30.12±2.54, 0.52±0.22 to 1.21±0.17 and 0.46±0.42 to 0.60±0.04, respectively. Highest FCR (7.81±0.22) was found in T1 and the lowest FCR (5.78±0.36) was found in T4. The highest PER (0.60±0.04) was found in T4 and the lowest PER (0.46±0.42) was found in T1. The highest survival rate (63.89±4.81) was found in T4 and lowest survival rate (47.22±9.62) was found in T1. Best growth performance was found in T4 followed by T3, T2 and T1. The present research findings suggested that the best growth performance and survival rate of Labeo rohita was obtained from supplementation of 600 mg vitamin C per kg feed containing diet which could be chosen by the fish feed manufacturer and fish farmers. Ahmed, M., Ferdous, Z., Paul, M., Rashid, M. H. & Hossain, M. S. (2018). Effect of dietary vitamin C on the growth and survival rate of rohu (Labeo rohita). Journal of Bioscience and Agriculture Research,16(02), 1375-1385. Ahmed, M., Ferdous, Z., Paul, M., Rashid, M. H. and Hossain, M. S. “Effect of dietary vitamin C on the growth and survival rate of rohu (Labeo rohita)”. 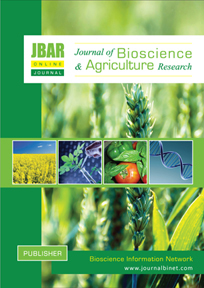 Journal of Bioscience and Agriculture Research, 16. 02(2018): 1375-1385. Ahmed, M., Ferdous, Z., Paul, M., Rashid, M. H. and Hossain, M. S. “Effect of dietary vitamin C on the growth and survival rate of rohu (Labeo rohita)”. Journal of Bioscience and Agriculture Research, 16 no.02(2018):1375-1385.